The apartment is situated in a quiet, leafy location close to the centre of Bologna, with great access to public transport on its doorstep. The building dates back to the late 1800s and the apartment was completely renovated in 2014. It is within easy reach of the city’s hospitals, train station and airport, with convenient bus links to all of these nearby. It is also very close to the portico of St. Luca, from where a winding covered walkway leads up to the sanctuary of the same name. The city centre is just a few minutes walk away through the “Pratello” (Bologna’s Greenwich Village). There is free wi-fi inside the apartment. Comfortable, clean space with a lovely view of the garden, kind and helpful host, vicinity of all the amenities – bus station, supermarket, farmacy and so on. The historical center of the city is within walking distance. 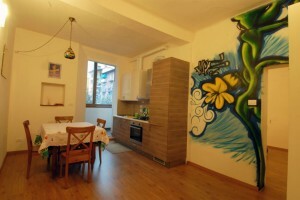 All in all, we recommend this apartment wholeheartedly! Saluti cordiali to our host!